Two teams made it two wins out of two in the Macron East Sussex Football League Premier Division last weekend. Hawkhurst United continued their strong start following promotion from Division One with a 7-0 win away to Rock-a-Nore. Four goals from Danny Mitchell did much of the damage, and he was supported by further strikes from Callum Marsh, Oliver Vidler and Scott Penfold. Battle Baptists also boast six points, although it took an 80th minute winner from Ian Rafati to overcome Robertsbridge United 1-0. Ore Athletic are unbeaten after winning 5-1 away to still pointless Mountfield United. Jack Daniels (2), Toby Payne, Grant Cornelius and Scott Ramsay were the Ore scorers. Sedlescombe Rangers also have four points on the back of a 3-3 draw in a good game against defending champions St Leonards Social, who are still to register their first win. Colton Alleyne-Davis, Dominic Cruttenden and Darren Hensher scored for the hosts, with Philip Hatch, Rhys Warren and Del Longley replying for Sedlescombe. Peche Hill Select chalked up a comprehensive 9-0 victory away to Brighton Electricity in round one of the Sussex Intermediate Cup. Shane Friend bagged a hat-trick, Connor Robertson and Callum Smith netted two apiece, and there was one each for Allan McMinigal and Steve Johnson. 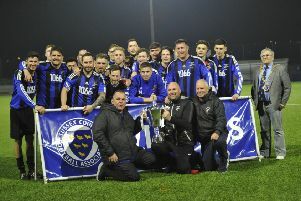 Eastbourne Rangers are the only team with maximum points in Division One after putting on a sensational display to overcome Wadhurst United 9-0 at Eastbourne Sports Park. Ticehurst are second in the early table in light of winning 10-6 in an amazing game away to AFC Hastings, for whom Wes Peoples plundered four goals and still ended up on the losing side. Rob Guile scored a hat-trick in the first 10 minutes for Ticehurst en route to a five-goal salvo. Robert Briley scored a hat-trick, and a goal each from Casey Ham and James Smith got Ticehurst into double figures. Without a recognised goalkeeper available to them, Hastings’ tally was completed by goals from Stewart Keogh and Mark Blanche. Sidley United are level with Ticehurst on four points after winning 3-1 in a closely contested match at home to Crowhurst. The hosts slowly got into the game and a goal at the end of the first half by Sam Thompson, followed by late strikes from Ashley Elphick and Arron Scrase, saw Sidley claim all three points. In the division’s other game, The JC Tackleway beat Old Hastonians 5-3 in an eight-goal thriller. A brace from Michel Burgess, and one each from Charlie Cornford, Joseph Powell and Josh Eaton gave Tackleway their first points of the campaign. David Pugh (2) and Todd Fitz-Hugh replied for the hosts. Eastbourne Athletic and Herstmonceux boast six points out of six at the top of Division Two, and both teams have scored five goals and conceded two to boot. Athletic came away from Peche Hill Select II with a 2-0 victory, while strikes by William McLaughlin, Todd Seavers and Ashley Hawkins gave Herstmonceux a 3-1 win at home to Hastings Rangers, whose club captain Joe Harmer rounded-off a great individual performance with a goal. Little Common III led three times only to be pegged back on each occasion by Bexhill AAC as the sides shared six goals at Sidley Recreation Ground. Callum Gould opened the scoring for Common with a free kick taken from his own half. Further goals from Toby Smith and Andrew McTear for Common were cancelled out by Vinny Heron, Max Thompson and Doni Dovla for Bexhill as both teams remained unbeaten. Icklesham Casuals opened their account for the campaign with a 5-0 win over Catsfield. Two goals each from Sean Baker and Phil Badrock, along with one from Bradley Mepham, made up the scoring. In a closely contested match at Peasmarsh United, it took a 90th minute goal from Sam Dangerfield to give Northiam 75 a 1-0 victory. Mayfield are the only club with six points in Division Three following a comprehensive 6-1 win against West Hill United. Danyal Aldous scored United’s consolation. Bexhill United II remain unbeaten after goals either side of half time from Jordan Mote and Ben Packer earned a 2-1 win against Orington. Dale Watson pulled one back. Hooe Sports also have four points. Karl Hassan scored straight from a corner and Andy Saunders also found the target in their 2-1 win away to Sedlescombe Rangers II. Sydney Moffat Bailey netted for Sedlescombe. An experienced St Leonards Social II side began its season by winning 6-2 away to Burwash after opening up a 4-0 half time lead. Two goals each from Mark Larkin, Ashley McCann and Emile Tambeh gave Social the points, with Kieren Martin and Mark Pickles replying for the home side. Westfield III kicked-off their season with a 5-1 success against Herstmonceux II. Two goals from Billy-Jo Driver, and one each from Toby Pearce, George Driver and Zak Hardiman made up the tally for Westfield. Grasshoppers Old Boys and Conquest United have six points out of six in Division Four. Grasshoppers notched up a 7-3 win over Bexhill AAC II, whose goals came from Richard Saunders (2) and Harry Saville. Matthew Angella (4), Luke Ticehurst, Adam Sparks and Joshua Macdonald netted for Grasshoppers. Godswill Chukwuemeka scored both goals, including a penalty, for Conquest in their 2-1 defeat of The JC Tackleway II. James Brann scored for Tackleway in a game where all the goals came during the second half. Third-placed Punnetts Town needed a composed late finish by Anthony Harvey - his second of the game - to beat Hawkhurst United II 2-1. Jason Baldock scored for Hawkhurst in the first half. A late goal by James Jeffreys claimed all three points for Bexhill Rovers in their 3-2 win against Battle Baptists II. Luke Newbury had earlier scored two for Rovers, but these had been cancelled out by Joshua Reuter and Byron Lear. In the other game, Wittersham II lost 5-3 away to Victoria Baptists in their first match of the season despite goals from George Ball, Carl Davey and Kelvin Lowes. Magham Down are the only team with maximum points in Division Five. They won 2-1 at home to Icklesham Casuals II, for whom Daniel Russell netted. Sandhurst head a quartet of clubs on four points after four goals from Andrew Turner and a Ben Cooper hat-trick gave them a 7-0 win over St Leonards. A superb run and cross from Chris Ford set up Ben Cowell to score the first goal for Sedlescombe Rangers III in their 2-1 win at home to Battle Baptists III. Billy Wood scored Rangers’ other goal in the second half. FC Westridge and Robertsbridge United II shared the points in a 1-1 draw. Ben Thorpe scored for Bridge.